Is there a limit to how long my courses can be live? You can activate and deactivate courses as you choose! 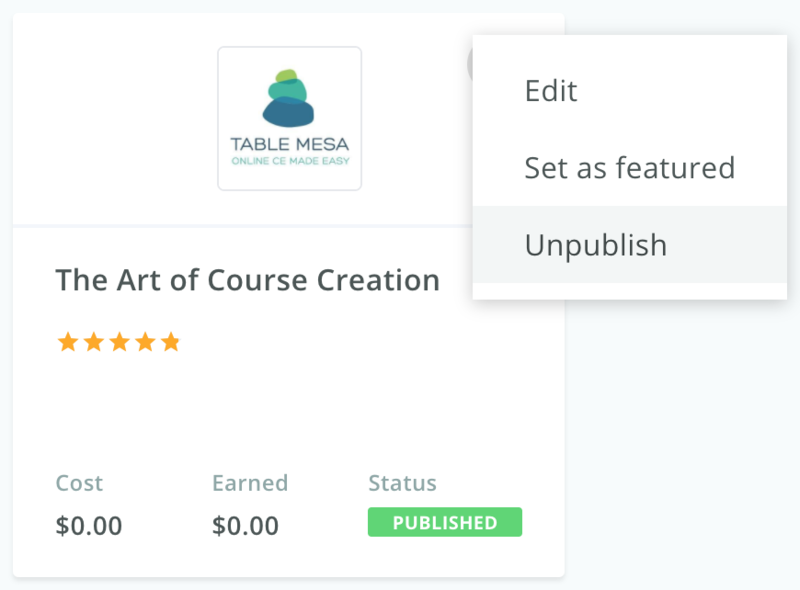 Any courses you make on Table Mesa can be set to active or inactive as you choose. The only date that we comply with are the license renewal dates, and we do not set any expiration dates for your published courses. You have complete control to choose how and when you want to have your courses live. If you would like to have a course available for a certain amount of time, simply deactivate the course when you are ready to take it down. If you want it to be live again, just update the content as needed and activate it again. Log in to your account, and click on "Courses" at the top of your page. Scroll down, and click on the 3 dot menu on the course card. Here you have the option to edit, set this course as your featured course, and publish/unpublish, depending on it's current status. The 'Status' box at the bottom of your page will tell you if the course is publish, in the draft phase, or deactivated.